Lisburn’s Jack Young was crowned 250cc British Quad Champion for 2018 after the final round of the championship at Foxhills in Wiltshire was cancelled as the track was unusable due to the bad weather leading up to the meeting. The 15 year-old son of ex road racer Derek, was disappointed at the final round being cancelled but at the same time delighted at winning his first British title on the Young’s Tuning Yard CRF 250 Honda. “What a fantastic season with some great close battles with Robbie Wood and Alfie Walker all through the year. With the Foxhills meeting being cancelled I am champion and over the moon to say the least,” said Jack. Jack began his racing career five years ago and has worked his way to the top of his game claiming the Ulster and Irish Championship in 2017 before challenging for the British title in 2018. The teenager’s first British overall win came at round three of the championship and it only got better with him sweeping the boards at Wokinham in July as he won all three races at round four of the series. From there the rest is history. Now Jack intends moving into the premier class to race at home and British championships. “It will be a learning curve but by the end of the season I plan to be up at the front. Meanwhile the final round of the Maxxis British Championships took place at Lyng at the Calders Hill circuit in Norwich with local riders Martin Barr and Glenn McCormick competing in the MX2 class. Ballyclare’s Barr qualified the Revo Husqvarna third fastest for the two motos and in race one finished eighth behind race winner Dylan Walsh, followed by fourth in race two behind Conrad Mewes, giving him fifth overall and fifth in the final championship standings behind newly crowned champion Conrad Mewes on the locally based ASA Hitachi KTM. “The track was really fast and I was happy with third in qualifying and was looking forward to the opening moto. In his second and final race for the team things went better as he explains. “I made a better start lying fourth into turn one and although I closed on my team-mate Mel Pocock I just couldn’t get close enough to make the pass and that’s where I finished. “It was the end of a very tough and frustrating year and I am glad to get the season over and have a break. Now I have to focus on securing a ride for 2019.,” said Barr. 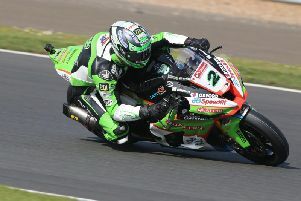 McCormick was pleased with his final British Championship meeting finishing 10th in race one and 11th in race two on the Watts Motorcycles KTM. The newly crown: “I’m extremely happy with today’s performance. I qualified 11th despite not putting together a perfect lap then in race one I was second off the gate but Louis Tomes passed me and I was stuck behind him for a few laps. It was an eventful race two for the Glenoe rider. “I went over the handlebars and got run over by quite a few bikes before gathering myself up way down in twenty ninth place. I had a lot of work to do but I put my head down and fought back to 11th by the chequered flag.